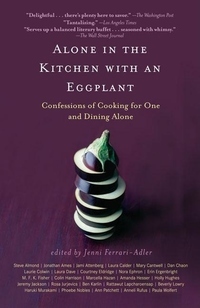 Part solace, part celebration, part handbook, Alone in the Kitchen with an Eggplant offers a wealth of company, inspiration, and humor--and finally, solo recipes in these essays about food that require no division or subtraction, for readers of Gabrielle Hamilton's Blood, Bones & Butter and Tamar Adler's The Everlasting Meal. Steve Almond, Jonathan Ames, Jami Attenberg, Laura Calder, Mary Cantwell, Dan Chaon, Laurie Colwin, Laura Dave, Courtney Eldridge, Nora Ephron, Erin Ergenbright, M. F. K. Fisher, Colin Harrison, Marcella Hazan, Amanda Hesser, Holly Hughes, Jeremy Jackson, Rosa Jurjevics, Ben Karlin, Rattawut Lapcharoensap, Beverly Lowry, Haruki Murakami, Phoebe Nobles, Ann Patchett, Anneli Rufus and Paula Wolfert. View our feature on the essay collection Alone in the Kitchen with an Eggplant.